Talk about hitting the nail on the head. Sometimes it’s hard to remember that Trump has been president of the United States for only six months. Some days it feels like six years or even six decades. As the Russia scandal continues to swirl around him, his family, and the campaign team that helped elect him, one can see the situation becoming increasingly like a Tolstoy novel with new revelations of meetings with Russian operatives that spring to light with each passing day. The news this week that Donald Trump Jr. held a meeting with a Russian lawyer linked to the Kremlin to discuss “dirt” on former Democratic presidential candidate Hillary Clinton has blown the situation in Washington DC wide open. No one talks of anything else. Media coverage of the much-ballyhooed health care bill, which arrived in the Senate a dead letter and looks like it will leave as one as well, seems strained and foreign. Big papers like the New York Times and the Washington Post, and cable outlets like CNN and MSNBC, are tracking the fate of the bill in the Senate but only out of a sense of duty. The real story is the Trumps, whose ludicrous bumblings and travails have become America’s favorite TV novella. The reports of Trump hunkered down in the Oval Office, seething at “unfriendly” media reports, raging at his staff, watching endless tapes of “Fox and Friends” to keep his spirits up, circulate everywhere. Although this image of Trump is denied by numerous talking head flunkies on endless cable TV shows, no one believes them. Why bother? No sooner is the denial out of their mouth when Donald Trump is tweeting out the exact opposite nugget, brazenly confirming what his minions have tried so hard to deny. Don’t be fooled, however, by the dysfunction on display. Things are happening in the Trump administration. After years of numerous presidents creating regulations and agencies without the approval of Congress, Trump and his surrogates are engaged in the destruction of the regulatory system in Washington DC. Whether it’s clean air, clean water, better schools, consumer protections – any regulation that exists to protect the American public but hinders American business in any way, the Trump administration is trying to get rid of it. Their success rate is worrisome. It’s important not to sleep on the Trump administration. Granted, that seems a difficult task. How could you worry about an administration that makes the Keystone Cops looked like the A-Team? It just seems too surreal to contemplate. Yet one cannot totally rule out the idea that this all part of some master plan by Trump to “make America great again”… In his image of course. Heaven knows he’s pulled a fast one on us before. He is in the White House after all. No, that seems a bridge too far. It must be that these successes for the Trump administration are happening despite the events in the White House. After all, what have we learned about Donald Trump in the past six months? That he is thin-skinned to a fault. That he is a misogynist pig. That he has the diplomatic skills of a sponge. That he has the attention span of a potato. That he can’t keep his mouth shut or his hands off his smart phone when he should. That he is malicious, holds grudges and has the temperament of a five-year-old child. That he lies not occasionally but habitually. Americans don’t seem to understand how dangerous it is to have a man like this in the White House. At this moment he has a team of Republican operatives doing opposition research on members of the media. He intends to get even with anyone who has slighted him. This means that no media organization – other than the obsequious Fox News – is safe from his demented desire for revenge. It’s not about protecting America’s interests, it’s always about looking after The Donald. He is the putz in the room. And the joke is on America. Only we’re not laughing. Tom Regan is a journalist in the Washington, D.C., area. 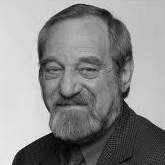 He worked for the Canadian Broadcasting Corporation and with the National Film Board in Canada, and in the United States for the Christian Science Monitor, Boston Globe, and National Public Radio. A former executive director of the Online News Association in the U.S., he was a Nieman fellow at Harvard in 1991-92, and is a member of the advisory board of the Nieman Foundation for journalism at Harvard. Facts and Opinions is a boutique journal of reporting and analysis in words and images, without borders. Independent, non-partisan and employee-owned, F&O is funded only by you, our readers. We are ad-free and spam-free, and do not solicit donations from partisan organizations. To continue we need a minimum payment of .27 for one story, or a sustaining donation. Visit our Subscribe page for details and payment options, or donate below. With enough supporters each paying a small amount, we will continue, and increase our original works like this. See CONTENTS for our current stories. Sign up for emailed announcements of new work on our free FRONTLINES blog; find evidence-based reporting in Reports; commentary, analysis and creative non-fiction in OPINION-FEATURES; and image galleries in PHOTO-ESSAYS. If you value journalism please support F&O, and tell others about us. The bi-partisan outpouring of unity that followed this week’s shooting at the GOP baseball practice in Alexandria, Virginia, was a welcome respite in the never-ending deluge of hate-filled rhetoric that overwhelms political discourse daily in the United States. But it was only a moment. And before the moment itself was over, several voices had already resumed stone-throwing at the opposition. Although Republican and Democratic lawmakers on Capitol Hill appeared genuinely shaken by the shooting at the ballpark that left Louisiana Republican Steve Scalise in critical condition, which led to several very public statements about unity, the usual suspects outside the Beltway were soon filling the airwaves with bile. First came Newt Gingrich, who blamed the left for a rise in violence in America. Well, the left is partially to blame for sure, but it wasn’t a leftist who stabbed two men to death on the train in Portland Oregon, or who shot nine African-Americans to death in a church in Charlotte. It’s not leftists who have been holding racist, bigoted rallies across the country against Muslims. The most enlightening comment about Gingrich came from a Democratic member of Congress, who noted that the change in the political discourse in the United States can be traced back to Newt Gingrich’s election as Speaker of the House of Representatives (it’s also right around this time that Fox News came into being). And it is certainly true that Gingrich played a key role in the development of the 20th century version of the demonization of your opponent as political strategy. And when talking about voices that increase, rather than reduce, the tension in the country, where would we be without mentioning Alex Jones. Jones, an unrepentant bigot and liar, reminds me of a man who runs into a burning building with a can of gasoline. Despite the fact that he’s had to apologize for numerous lies lately (his made-up stories about Hillary Clinton and members of her staff running a child slavery ring out of a pizza shop in Washington DC, or false allegations he made against the yogurt maker Chobani), he’s become something of a celebrity bête noire. He earned praise from Pres. 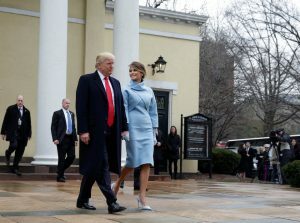 Donald Trump (who praises anyone he thinks likes him) and he is the subject of a very controversial interview with Megyn Kelly on NBC, which has outraged critics on the left and the right primarily because of his vile fabrication that the shootings at Sandy Hook elementary school never happened. While progressives may not have as many public voices pushing a hate-filled agenda as the far right, they are there. One only needs to look at the shooter himself, a man who had volunteered on Bernie Sanders’ campaign in Illinois, to understand that there are Democrats who don’t understand, or who don’t want to understand, the difference between heated political rhetoric and political violence. Unfortunately, it’s not going to get much better. My son, a college student in Wisconsin, has been warning me for the past two years to expect more political violence. These warnings increased during Donald Trump’s presidential campaign, and his use of violent and hate-filled language during 2016. Things have not improved since Trump’s election. I didn’t want to believe my son. But he has a much better grip on what is happening just below that layer of information most of us older Americans rely on, from cable news and newspapers. I am now inclined to agree with him. One only needs to look at recent clashes between far-left Antifa (anti-fascist) forces and far-right pro-KKK, or white supremacist groups like National Vanguard, to see where this may be headed. While most clashes between these opposing forces have been relatively low-level so far, one gets the sense that they are ready to explode at any second. 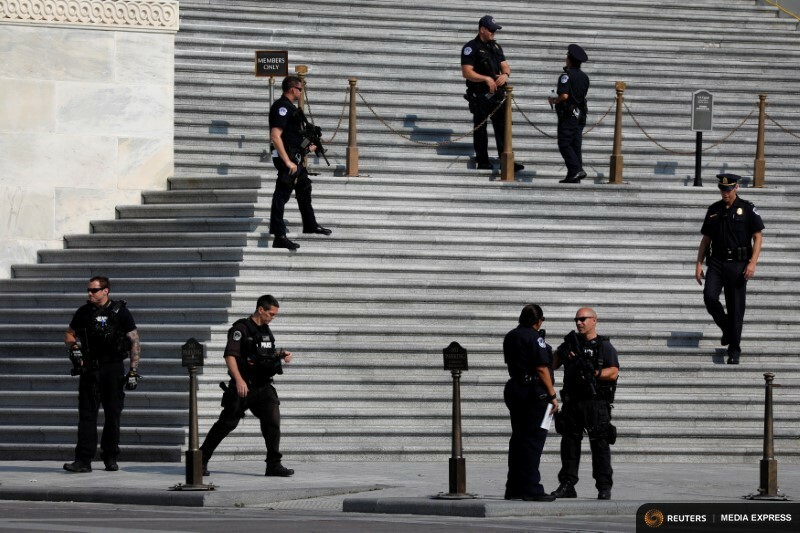 Compounding all of this is the fact that there are 300 million guns in the United States, and after last week’s shooting in Alexandria, many Republican lawmakers and groups like the NRA, want there to be more. Perhaps the U.S. will reach a point where the tension will produce a reverse reaction and some form of sanity will be restored to political discourse in America. Then again, one day an alien spaceship piloted by unicorns may land on earth. I’m not willing to bet on which will happen first. Now that was a day full of news. First the much-anticipated testimony of former FBI director James Comey in front of the Senate Intelligence Committee about his dealings with US Pres. Donald Trump. And then later in the day the unanticipated flop of Teresa Mays’ conservative government in the British election. My family was getting angry at me for spending so much time in front of a screen. Let us focus, however, on Mr. Comey’s testimony. How you responded to what he said had a great deal to do with your own particular political persuasion. Democrats celebrated when Comey called Trump “a liar,” and laid the groundwork for a possible obstruction of justice charge with the revelation of his one-on-one meeting with Trump, when he was asked to “let go” of the investigation into former National Security Advisor Michael Flynn’s dealings with Russians. Republicans, on the other hand, rejoiced at the fact that Comey confirmed that he had told Trump three times that he was not under investigation, and that Comey said former Atty. Gen. Loretta Lynch had asked him to fuzz the description of an investigation into former Democratic presidential candidate Hillary Clinton’s email server. Republicans also rejoiced when Comey seemingly outed himself as a leaker. The truth, as they say, lies somewhere in between. 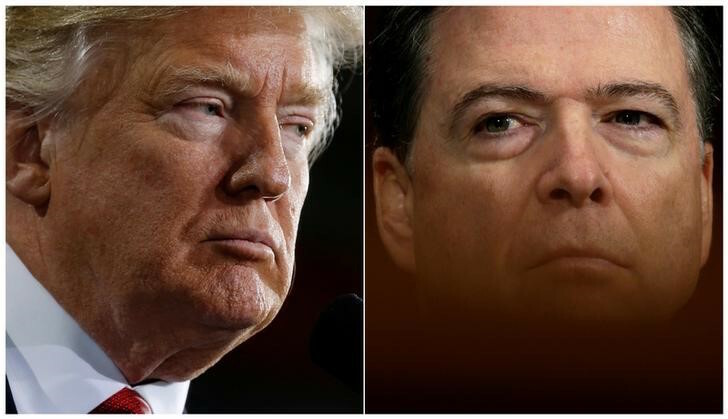 One of the most important questions is, who is lying – James Comey or Donald Trump? Tthey both can’t be telling the truth. Comey testified under oath that Trump asked him to pledge his loyalty if he wanted to keep his job, and that in a later meeting asked him to let go of the investigation into Flynn. Trump’s private lawyer, in a statement that one that television commentator compared to a “goat rodeo”, denied that Trump said these things. My money is with Comey, not because he is anymore likable than Donald Trump, but Trump has a record of falsehoods and misstatements going back decades. 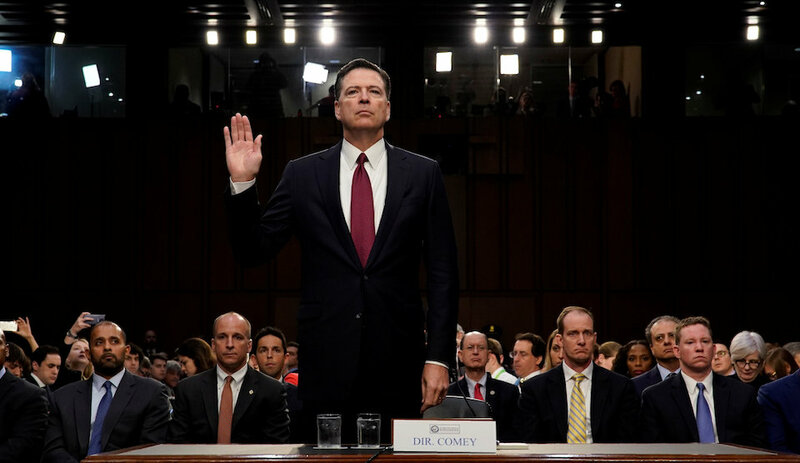 Comey testified under oath. And if anybody understands the penalties of lying under oath, it’s the former director of the FBI. Most Americans share my view that Comey is more believable, according to public opinion polls – something like 70 per cent, according to the latest Pew poll. There is something for everyone in the rest of the testimony. Allow me to enumerate. The fact that Trump made everyone, including the Atty. Gen., the VP, his Chief-of-Staff, and his son-in-law Jared Kushner, leave the Oval Office before he spoke to Comey about the Flynn investigation, does not look good for the president. Even the Republican members of the Senate Intelligence Committee commented on this occurrence. You don’t ask everyone to leave the room if you’re going to request an innocent favor from a high-ranking government official. This will be a problem for Trump. The private dinner that Trump had with Comey, where he asked Comey to pledge in his loyalty, falls into the same category. It just should not have been done. Some Republicans and Trump sycophants are trying to portray this as naïveté on Trump’s part. Which is fine, but ignorance of the law is no defense. To go back to the question of truthfulness, this is where the meticulous notes that Comey took after each of his meetings with the president give him the strong upper hand. It’s long been practice in criminal cases, for instance, that notes of a meeting or conversation made immediately after it occurred can be used as evidence. The news that Comey, after reading Pres. Trump’s tweet about possible tapes of their meeting, decided to leak news of those notes to the New York Times via a friend is not a plus for the former FBI director. He was careful in his testimony to say that he had not leaked anything of a confidential nature, and he has had a history in the past of selectively releasing information to the media that cleared him of any involvement in other damaging events. Comey is the consummate Washington insider, and he knows how the game is played. Republicans and Trump supporters will try to make hay from this news, but there is no illegality here. Comey is a private citizen and he is free to do what he wants with these notes, especially considering Trump had already tweeted about these events, undermining any chance of claiming executive privilege. The question, however, of how this will play in the public, is different. This looks too cute by half, and for a man who has spent much of his career decrying leakers and the damage that they do, you can bet that past statements will be used against Comey. There were two other people who did not do well yesterday: current Atty. 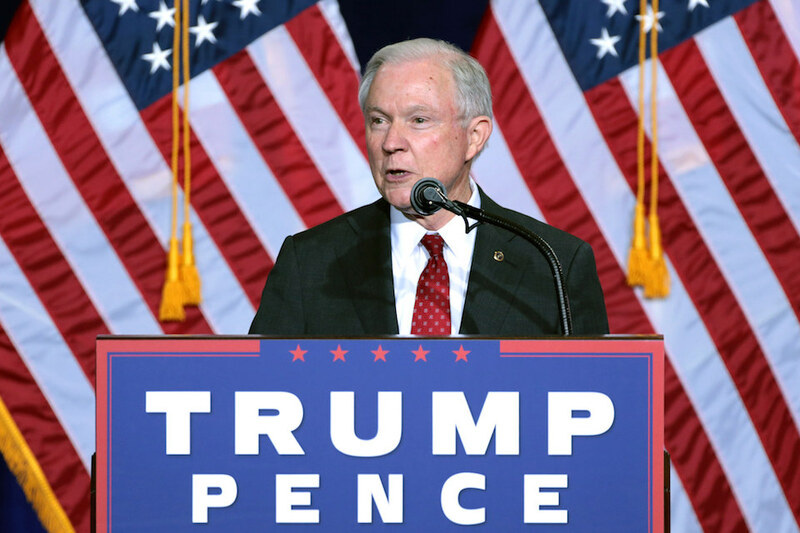 Gen. Jeff Sessions and former Atty. Gen. Loretta Lynch. Comey’s testimony about why Sessions recused himself from anything involving Russia and the Trump campaign created more questions than answers. It led to speculation that the current Atty. Gen.’s past involvement with Russian diplomats or agents was more complicated than previously understood. Like former Gen. Michael Flynn, Sessions could be in for a world of hurt. And the surprise news that Loretta Lynch had asked Comey to fudge his description of the investigation into possible misuse by Hillary Clinton and her staff of her private email server hurts Clinton’s complaint that Comey cost her election. It also shows why former Pres. Bill Clinton’s tarmac meeting with Lynch on a private jet was so disastrous for the Clinton campaign. Combined with Lynch’s request to fudge the description of the investigation, it provides Comey with more than enough reason to justify taking the controversial steps that he did. The Russians are coming! And they mean business. If there was a non-political moment that stood out in Thursday’s testimony by Comey, it was his insistence that the Russians did try to undermine the United States election and its electoral system, and that they will continue to do so. And that this is a real threat to the United States. (This also gave Comey a chance to take another shot at Trump, by pointing out that for all his concern about his friend Mike Flynn, Trump never once asked about how the Russians had digitally attacked the United States and any possible future threats.) And this is a point that both Republicans and Democrats can agree on. Count on it getting a lot more exposure in the coming months. In the end, Comey’s testimony hurt Trump, but it did not destroy him. There is certainly not enough here to impeach Trump. It did show that former FBI director, and now special prosecutor, Robert Mueller’s investigation into the Trump campaign’s involvement with the Russians is now the only game in town. Watch the video of Comey’s appearance before the Senate Select Committee on Intelligence, on the Senate site. When he’s on the Web, #45 likes Infowars, Alex Jones’ conspiracy theory website, promoting theories such as blaming the US government for the Newtown school massacre, and claiming the media deliberately don’t report terrorist incidents in order to push a diversity agenda. Each article costs an author hours if not days of research and writing. You’ve already invested your own time in reading this work. Now you have a chance to put your money where your mind is – make a small direct donation towards this author’s next article. To support F&O’s overall site, scroll to the bottom of the page. Either way, your support goes directly to the journalists who own and operate this news boutique. On the other hand, #45 is going to have to start flipping dials and searching websites for new news sources, because his favourite sources are rapidly self-destructing. Take Roger Ailes, who (with 20th Century Fox owner Rupert Murdoch’s approval) shaped Fox News into a vehicle for white men’s revenge fantasies, as well as a very successful business, with profits estimated at more than $1 billion a year. “Murdoch tapped Ailes to create and run the network in 1996, ushering in a controversial new era in cable news,” CNN Money reported last year. “By hiring hosts like Bill O’Reilly and Sean Hannity and enforcing a conservative editorial point of view, Ailes developed a virtual public square for the American right and filled a void on television. 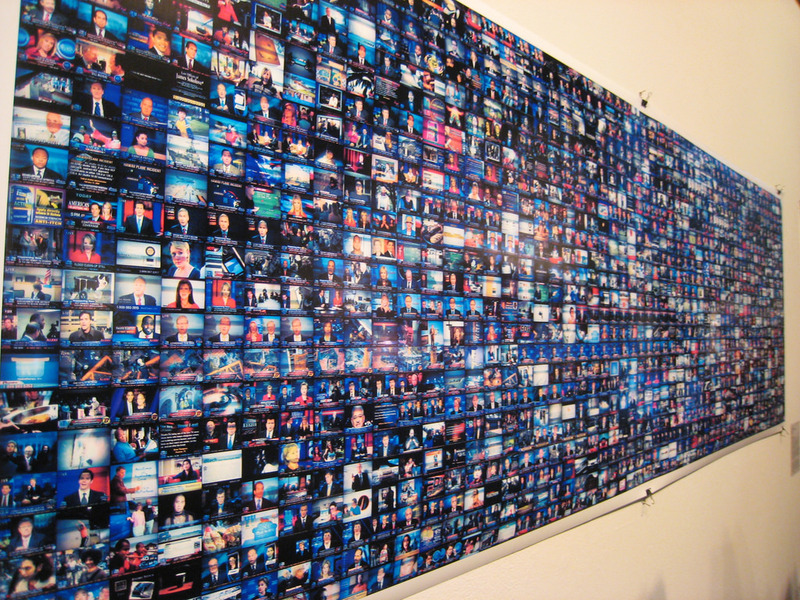 It has dominated all other cable news channels for 14 years. Then came a shock. Last year, Roger Ailes had to resign from Fox News, after news anchor Gretchen Carlson filed a sexual harassment lawsuit against him – and other Fox anchors quickly piled on with their own complaints about his behaviour. He’ll need the $40 million contract-payout he reportedly received from Fox, to respond to Gretchen Carlson’s lawsuit, and perhaps others. This week, Fox News has also fired Bill O’Reilly, (and risked his audience of four million cable viewers), for the same reason as his boss: charges of sexual harassment. CNN called this move a very big deal. “[Bill] O’Reilly… was the front-facing spokesman for the modern-day conservative movement just as now-deposed Fox boss Roger Ailes was its behind-the-scenes architect. The New York Times broke the story on April 1, reporting that O’Reilly had settled sexual harassment with five women to the tune of $13 million with five women – and the Fox network stood by him and helped with the payments. Alex Jones is a leading “Truther.” “It would be unthinkable for any other major-party presidential candidate to willingly appear on a show with a man who believes that the U.S. government was involved in conducting the 2001 World Trade Center attacks, as Jones does, or to intimate that he would not accept the results of the election, an impulse that Jones encourages,” wrote Andy Cush in early 2016. Yet #45 has echoed many of Jones’ completely unsubstantiated theories. A Clinton ad used a clip from Jones’ radio show where Jones said, “It is surreal to talk about issues here on air, and then, word-for-word, hear Trump say it two days later.” While not a top-tier player like Steve Bannon, Jones has been highly influential to #45’s tweets and public comments. Another shocker – this last Tuesday, April 18, Kelly Jones, Jones’ estranged wife, sued for divorce and sole custody of their three children, citing some of Alex Jones’ on-air rants as proof that he is mentally unstable and not a suitable parent. “He says he wants to break Alec Baldwin’s neck. He wants J-Lo to get raped,” she testified. He broadcast his show from their home, with the children present. Meanwhile, a dozen other big-name Fox News hosts have left for other venues. Bill O’Reilly is facing challenges in replacing his reputed $18 million annual salary. Alex Jones will probably need the performance of his life to carry on his radio and online career, not to mention his personal life. What all these personalities have in common, #45 included, is that they eschewed the politically correct. They openly portrayed white male rage about losing privilege. They, and the US public, are learning that the privileged white male position is inherently toxic, to themselves and others. 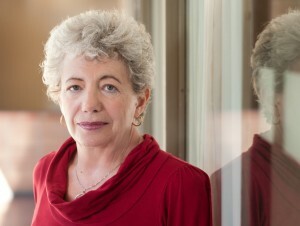 Penney Kome is co-editor of Peace: A Dream Unfolding (Sierra Club Books 1986), with a foreward by the Nobel-winning presidents of International Physicians for Prevention of Nuclear War. Read her bio on Facts and Opinions. Facts and Opinions is a boutique journal, of reporting and analysis in words and images, without borders. Independent, non-partisan and employee-owned, F&O is funded by you, our readers. We are ad-free and spam-free, and we do not solicit donations from partisan organizations. Please visit our Subscribe page or use the PayPal button below to chip in at least .27 for one story or $1 for a day site pass. Tell others about us, and follow us on Facebook and Twitter. The April 22 March for Science, like the Women’s March before it, will confront United States President Donald Trump on his home turf – this time to challenge his stance on climate change and vaccinations, among other controversial scientific issues. But not everyone who supports scientific research and evidence-based policymaking is on board. Some fear that a scientists’ march will reinforce the sceptical conservative narrative that scientists have become an interest group whose findings are politicised. Others are concerned that the march is more about identity politics than science. From my perspective, the march – which is being planned by the Earth Day Network, League of Extraordinary Scientists and Engineers and the Natural History Museum, among other partner organisations – is a distraction from the existential problems facing the field. Other questions are far more urgent to restoring society’s faith and hope in science. What is scientists’ responsibility for current anti-elite resentments? Does science contribute to inequality by providing evidence only to those who can pay for it? How do we fix the present crisis in research reproducibility? So is the march a good idea? To answer this question, we must turn to the scientist and philosopher Micheal Polanyi, whose concept of science as a body politic underpins the logic of the protest. Both the appeal and the danger of the March for Science lie in its demand that scientists present themselves as a single collective just as Polanyi did in his Cold War classic, The Republic of Science: Its Political and Economic Theory. In it, Polanyi defended the importance of scientific contributions to improving Western society in contrast to the Soviet Union’s model of government-controlled research. Polanyi was a polymath, that rare combination of natural and social scientist. He passionately defended science from central planning and political interests, including by insisting that science depends on personal, tacit, elusive and unpredictable judgements – that is, on the individual’s decision on whether to accept or reject a scientific claim. Polanyi was so radically dedicated to academic freedom that he feared undermining it would make scientific truth impossible and lead to totalitarianism. The scientists’ march on Washington inevitably invokes Polanyi. It is inspired by his belief in an open society – one characterised by a flexible structure, freedom of belief and the wide spread of information. But does Polanyi’s case make sense in the current era? Polanyi recognised that Western science is, ultimately, a capitalist system. Like any market of goods and services, science comprises individual agents operating independently to achieve a collective good, guided by an invisible hand. Scientists thus undertake research not to further human knowledge but to satisfy their own urges and curiosity, just as in Adam Smith’s example the baker makes the bread not out of sympathy for the hunger of mankind but to make a living. In both cases this results in a common good. Polanyi was aligning science with the economic model of the 1960s. But today his assumptions, both about the market and about science itself, are problematic. 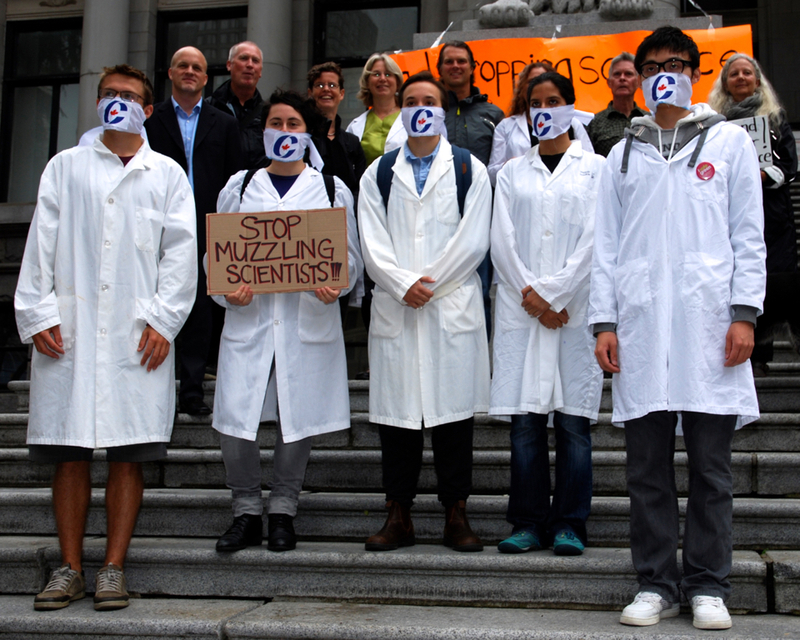 And so, too, is the scientists’ march on the US capital, for adopting the same vision of a highly principled science. Does the market actually work as Adam Smith said? That’s questionable in the current times: economists George Akerlof and Robert Shiller have argued that the principle of the invisible hand now needs revisiting. To survive in our consumerist society, every player must exploit the market by any possible means, including by taking advantage of consumer weaknesses. To wit, companies market food with unhealthy ingredients because they attract consumers; selling a healthy version would drive them out of the market. As one scientist remarked to The Economist, “There is no cost to getting things wrong. The cost is not getting them published”. It is doubtful that Polanyi would have upheld the present dystopic neo-liberal paradigm as a worthy inspiration for scientific discovery. Polanyi also believed in a “Republic of Science” in which astronomers, physicists, biologists, and the like constituted a “Society of Explorers”. In their quest for their own intellectual satisfaction, scientists help society to achieve the goal of “self-improvement”. That vision is difficult to recognise now. Evidence is used to promote political agendas and raise profits. More worryingly, the entire evidence-based policy paradigm is flawed by a power asymmetry: those with the deepest pockets command the largest and most advertised evidence. I’ve seen no serious attempt to rebalance this unequal context. A third victim of present times is the idea – central to Polanyi’s argument for a Republic of Science – that scientists are capable of keeping their house in order. In the 1960s, scientists still worked in interconnected communities of practice; they knew each other personally. For Polanyi, the overlap among different scientific fields allowed scientists to “exercise a sound critical judgement between disciplines”, ensuring self-governance and accountability. Today, science is driven by fierce competition and complex technologies. Who can read or even begin to understand the two million scientific articles published each year? Elijah Millgram calls this phenomenon the “New Endarkment” (the opposite of enlightenment), in which scientists have been transformed into veritable “methodological aliens” to one another. One illustration of Millgram’s fears is the P-test imbroglio, in which a statistical methodology essential to the conduit of science was misused and abused for decades. How could a well-run Republic let this happen? The classic vision of science providing society with truth, power and legitimacy is a master narrative whose time has expired. The Washington March for Science organisers have failed to account for the fact that science has devolved intowhat Polanyi feared: it’s an engine for growth and profit. A march suggests that the biggest problem facing science today is a post-truth White House. But that is an easy let off. Science’s true predicaments existed before January 2 2017, and they will outlive this administration. Our activism would be better inspired by the radical 1970s-era movements that sought to change the world by changing first science itself. They sought to provide scientific knowledge and technical expertise to local populations and minority communities while giving those same groups a chance to shape the questions asked of science. These movements fizzled out in the 1990s but echos of their programmatic stance can be found in a recent editorial in Nature. What we see instead is denial toward science’s real problems. Take for instance the scourge of predatory publishers, who charge authors hefty fees to publish papers with little or no peer review. The lone librarian who fought this battle has now been silenced, to no noticeable reaction from the scientific community. Trump is not science’s main problem today – science is. Andrea Saltelli has worked on physical chemistry, environmental sciences, applied statistics, impact assessment and science for policy. 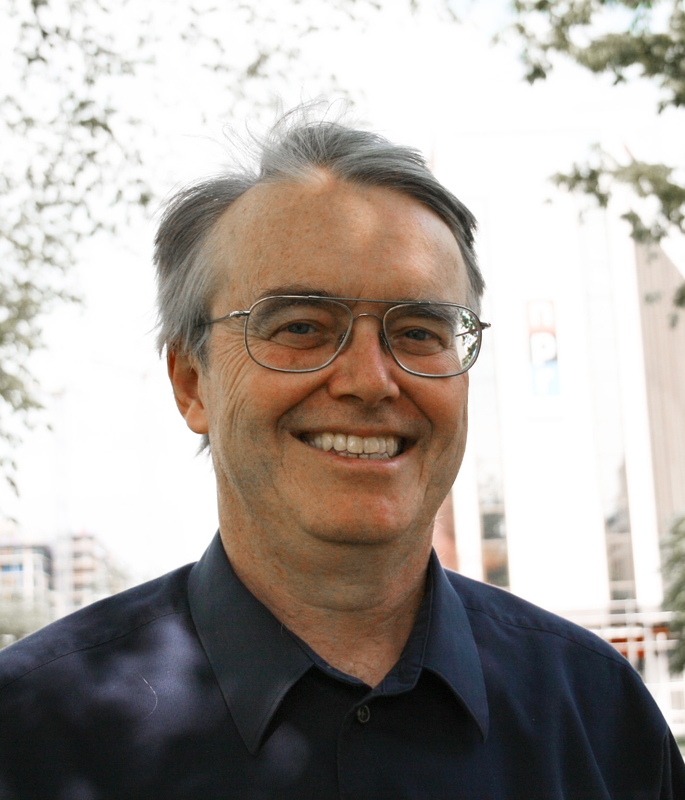 His main disciplinary focus is on sensitivity analysis of model output, a discipline where statistical tools are used to interpret the output from mathematical or computational models, and on sensitivity auditing, an extension of sensitivity analysis to the entire evidence-generating process in a policy context. At present he is in at the European Centre for Governance in Complexity, a joint undertaking of the Centre for the Study of the Sciences and the Humanities (SVT) – University of Bergen (UIB), and of the Institut de Ciència i Tecnologia Ambientals (ICTA) -Universitat Autonoma de Barcelona (UAB). The ECGC is located in the UAB campus in Barcelona. His latest works include Science on the Verge, a book on the crisis of science, a series of article of criticism of the Ecological Footprint He is an Adjunct Professor, Centre for the Study of the Sciences and the Humanities, University of Bergen, University of Bergen. It was meant as humour, but like all good humour it has a ring of truth to it. “Increasingly, it looks like we missed that sweet spot,” the fictional source said. This satire was written two weeks before news broke about United States Attorney General Jeff Sessions’ meetings with the Russian ambassador in 2016. If Borowitz’s humourous take on these events were true, then you could picture Putin wondering what the hell is going on. How’s a guy supposed to concentrate on disrupting elections in Germany, France, and the Netherlands when the puppets he installed in the United States don’t seem to be able to go a single day without a screw-up of some kind? How’s a Russian dictator going to put in place his plan to restore Russia to its once-prominent place in the world with that kind of help? Again, Borowitz writes humour. But this is starting to feel not so funny in real life. The question of the Trump administration’s involvement with Russia, and Russia’s attempts to undermine the 2016 American election, are starting to smell like three-day-old fish left in the sun. The Trump administration had vehemently denied that any member of its team met with any Russian official of any kind. And for a while it looked like the Russia story might get buried in a slew of other Trumpian actions, like the shortsighted, ill-advised, and soon-overturned attempt to ban refugees from seven different countries in the Middle East. Instead, Sessions lied. To Congress, to the media, and the American public. After the “failing” Washington Post (sad) broke the story of his meetings, as it had also done with Mike Flynn, the scramble was on. For a man who called for then-Atty. Gen. Loretta Lynch to recuse herself from the investigation into Hillary Clinton’s email server, after she had a tarmac meeting with Bill Clinton, Atty. Gen. Sessions was left with few options. And so Thursday he announced that he was recusing himself from any investigation into ties between the Trump administration in Russia. His troubles may not be over however, as that lying to Congress thing might become a sticking point. Nevertheless, the damage has been done. Suddenly the Trump team’s repeated denials of any meetings with any Russian officials were starting to sound like an NFL general manager who says that he has “complete confidence” in his team’s coach after a 2- 14 season. You know it’s just baloney. And sure enough, Sessions barely had time to step aside before word leaked out that several other Trump administration officials had also met with Russians during 2016. All of this must make Democrats delighted, but the truth is that it is bothering more than a few Republicans as well. So many heated denials followed by so many revelations that these denials were false creates a sense of cover-up that won’t go away. This is more than a question of “gotcha” politics. Behind all these disproved denials is a serious question of whether or not significant players on the Trump team colluded with another country in order to sabotage a political opponent. And in exchange for this help, these significant players told this other country that, once in power, it would go soft on sanctions and other measures that had been used to retaliate against its more outrageous actions. That’s why there is a word that is only being softly whispered at the moment, but you can feel its presence. That word is impeachment. It’s difficult to believe that less than two months into Donald Trump’s first term as president that there are people on both sides of the aisle even theoretically discussing his impeachment. Yet it is there. And as these Russian contacts grow in numbers and more questions are asked about why these discussions were held in the first place, that whisper may start to get much louder. Facts and Opinions is a boutique journal of reporting and analysis in words and images, without borders. Independent, non-partisan and employee-owned, F&O is funded only by you, our readers. We are ad-free and spam-free, and do not solicit donations from partisan organizations. To continue we need a minimum payment of .27 for one story, or a sustaining donation. Visit our Subscribe page for details, or donate below. With enough supporters each paying a small amount, we will continue, and increase our original works like this. 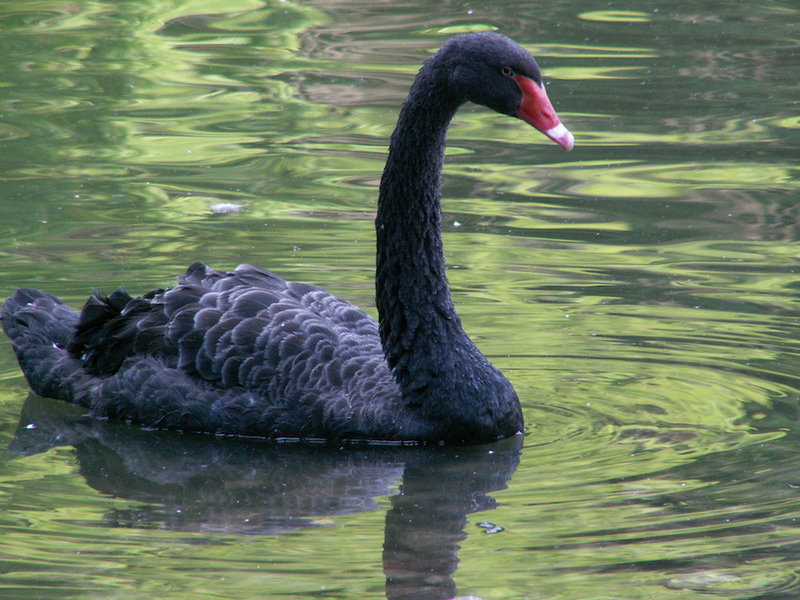 Is Donald Trump a “Black Swan”? As I drove my wife to catch the train into DC at 4 AM this past Friday morning, we listened to NPR’s daily rebroadcast of the BBC. At that time of the morning there is normally business programming of some kind and, because it is the BBC, it is almost always interesting. This particular morning Daniel Levin was being interviewed. The book sounds like a fascinating read, and in the interview Levin gave a taste of what he witnessed working with some of the world’s most powerful people, including Vladimir Putin, a story that some in the American government might find instructive. Then Levin said something that snapped me out of my half-drowsy stupor: he described Donald Trump as a “black swan.” Levin admitted he could be wrong, but said all the signs show that Trump fits the definition. Taleb’s definition of a black swan event perfectly describes the rise of Donald Trump, from clown celebrity to the most powerful man in the world. Just think about it. No one, no one, predicted that Trump’s candidacy would end up where it did. Even Trump in the beginning only saw a run for the White House as a chance to improve his brand overall, and perhaps generate a new TV show after he had been asked to leave The Celebrity Apprentice. And there is no doubt, as we have seen in barely two weeks of his administration, that our failure to predict this event is having catastrophic ramifications. Well, it’s pretty fair to say the system failed. But, it’s produced a most amazing result. Millions of Americans have suddenly found their voices and their citizenship. Pundits and historians are already comparing it to what happened with the Tea Party in 2008 after the election of Barack Obama. The Women’s March on Washington; the large protest that took place at airports particularly in America, but also around the world, after Trump’s immigration ban; upcoming marches by scientists; a protest to take place on April 15 about Trump not paying his taxes … These are just the most visible symbols that something perhaps not seen since the ’60s is happening. It’s also happening in a much smaller level. In my own rural Virginia community people are already organizing, some very publicly, some very privately. Information is being shared via social media about upcoming meetings, protests, phone numbers to call to contact House and Senate representatives. There is a new sense of constant motion. Reportedly, many Trump supporters are happy with the numerous odorous executive orders issued since he became president. But it’s important to remember that Trump is only president because of roughly 77,000 voters in Michigan, Wisconsin, and Pennsylvania. Many of those people were willing to make a bet on an unknown because they were tired of the status quo. This is what we missed, what we ignored, what we overlooked. I was particularly struck by a phone call from a young man in Pennsylvania to a NPR talkshow who said he participated in some of the protests against Trump’s executive orders, but admitted he had voted for Trump. 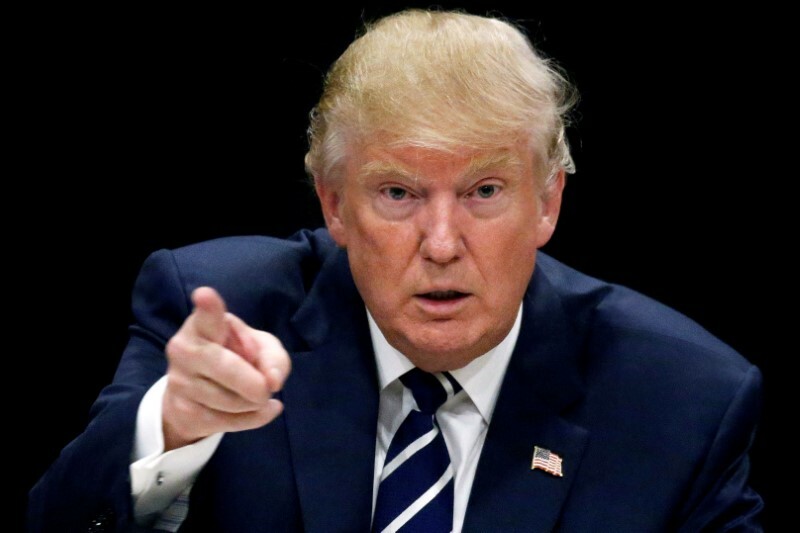 When asked why he voted for him, when he so obviously disagreed with many of the things the new president was doing, he answered that he was tired of the same old politics, that he was fed up with the Bush-Clinton dynasties, and that he felt Americans had to break away, and so he was willing to bet on Trump. He said he didn’t know if he would vote for Trump again but he felt it was right at the time. It’s hearing comments like these that give me hope that Donald Trump is indeed a black swan. And that if we pay attention, listen better and learn, then improve the system, we can make sure that a Donald Trump never happens again. In the fantasy world of America, globalization can be stopped dead in its tracks, and blue jeans will still sell for $20 a pair at Sam’s Club. Manufacturing jobs long vanished will be returned, despite the onslaught of automation …. Oh, it’s a wonderful world. Lollipops and unicorns and everybody wins the lottery under President Donald Trump. Too bad it doesn’t exist. Even as the inaugural party hangovers still throb in Washington, leaders in other capitals are dreaming up ways to discover what kind of blow-hard Donald Trump is. He has given them plenty to work with. 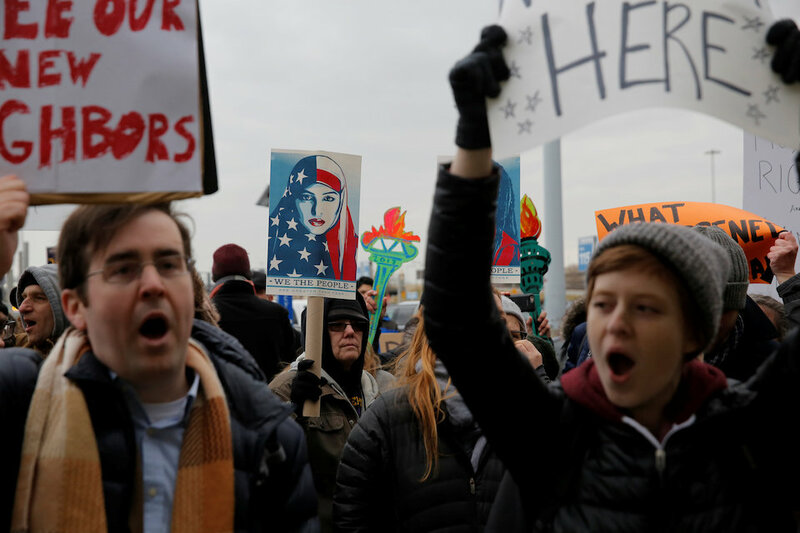 WASHINGTON (Reuters) – President Donald Trump’s most far reaching action since taking office plunged America’s immigration system into chaos on Saturday, not only for refugees but for legal U.S. residents who were turned away at airports and feared being stranded outside the country. Immigration lawyers and advocates worked through the night trying to help stranded travelers find a way back home. Lawyers in New York sued to block the order, saying many people have already been unlawfully detained, including an Iraqi who worked for the U.S. Army in Iraq. The new Republican president on Friday put a four-month hold on allowing refugees into the United States and temporarily barred travelers from Syria and six other Muslim-majority countries. He said the moves would protect Americans from terrorism, in a swift and stern delivery on a campaign promise. The ban affects travelers with passports from Iran, Iraq, Libya, Somalia, Sudan, Syria and Yemen and extends to green card holders who are legal permanent residents of the United States. 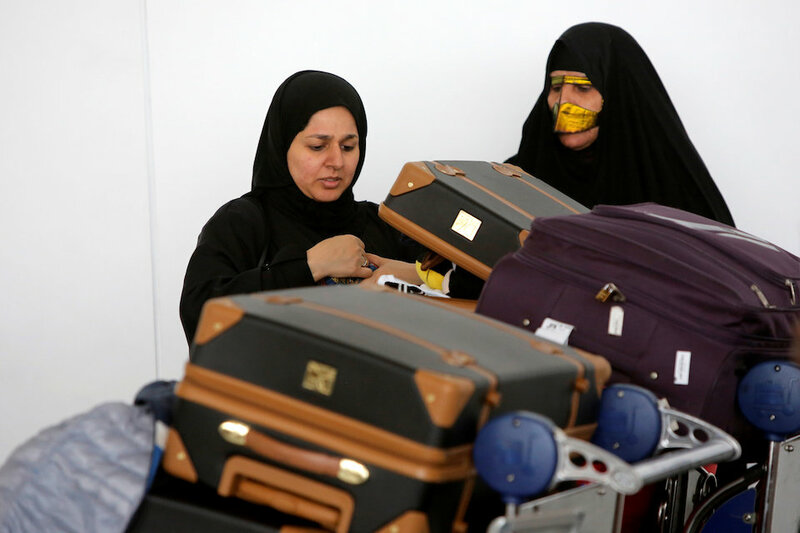 Arab travelers in the Middle East and North Africa said the order was humiliating and discriminatory. It drew widespread criticism from U.S. Western allies including France and Germany, Arab-American groups and human rights organizations. Iran condemned the order as an “open affront against the Muslim world and the Iranian nation” and vowed to retaliate. Of the seven countries targeted, Iran sends the most visitors to the United States each year – around 35,000 in 2015, according to the Department of Homeland Security. The ban extends to green card holders who are authorized to live and work in the United States, Homeland Security spokeswoman Gillian Christensen said. It was unclear how many legal permanent residents would be affected. A senior U.S. administration official said on Saturday that green card holders from the seven affected countries have to be cleared into the United States on a case-by-case basis. Legal residents of the United States were plunged into despair at the prospect of being unable to return to the United States or being separated from family members trapped abroad. “I never thought something like this would happen in America,” said Mohammad Hossein Ziya, 33, who came to the United States in 2011 after being forced to leave Iran for his political activities. Ziya, who lives in Virginia, has a green card and planned to travel to Dubai next week to see his elderly father. “I can’t go back to Iran, and it’s possible I won’t be able to return here, a place that is like my second country,” he said. Saleh Taghvaeian, 36, teaches agricultural water management at Oklahoma State University in Stillwater, said he feared his wife would not be able to return from Iran after a visit. In Cairo, five Iraqi passengers and one Yemeni were barred from boarding an EgyptAir flight to New York on Saturday, sources at Cairo airport said. Dutch airline KLM [AIRF.PA] said on Saturday it had refused carriage to the United States to seven passengers from predominately Muslim countries. Canada’s WestJet Airlines said it turned back a passenger bound for the United States on Saturday in order to comply with the order. A spokeswoman did not say which country the passenger had come from. At least three lawyers from the International Refugee Assistance Project were at the arrivals lounge at New York’s John F. Kennedy International Airport, buried in their laptops and conference calls, photocopies of individuals’ U.S. visas on hand. In Washington, the agencies charged with handling immigration and refugee issues grappled with how to interpret the measure. U.S. officials, speaking on condition of anonymity, said they were not consulted on the executive order and in some cases only learned the details as they were made public. Senior administration officials said it would have been “reckless” to broadcast details of the order in advance of new security measures. The officials told reporters that Homeland Security now has guidance for airlines. They dismissed as “ludicrous” the notion that the order amounted to a “Muslim ban.” Afghanistan, Malaysia, Pakistan, Oman, Tunisia and Turkey were Muslim-majority countries not included, an official said. Since it was announced on Friday, enforcement of the order was spotty and disorganized. Travelers were handled differently at different points of entry and immigration lawyers were advising clients to change their destination to the more lenient airports, she said. Houston immigration lawyer Yegani said officials denied travelers with dual Canadian and Iranian citizenship from boarding planes in Canada to the United States. The order seeks to prioritize refugees fleeing religious persecution. In a television interview, Trump said the measure was aimed at helping Christians in Syria. Some legal experts said that showed the order was unconstitutional, as it would violate the U.S. right to freedom of religion. But others said the president and U.S. Congress have latitude to choose who receives asylum. Lawyers from immigration organizations and the American Civil Liberties Union sued in federal court in Brooklyn on behalf of two Iraqi men, one a former U.S. government worker and the other the husband of a former U.S. security contractor. The two men had visas to enter the United States but were detained on Friday night at Kennedy airport, hours after Trump’s executive order, the lawsuit said. One of the men, former U.S. Army interpreter, Hameed Khalid Darweesh, was later released. 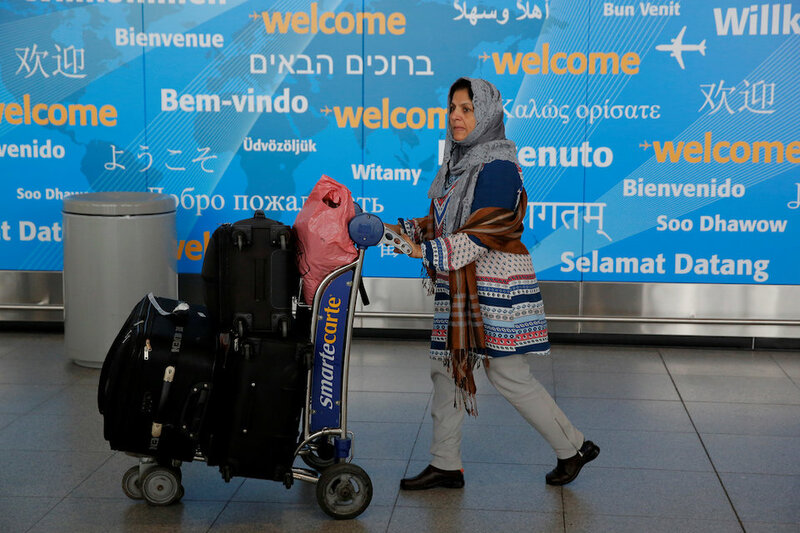 CAIRO/BAGHDAD (Reuters) – Arabs and Iranians planning U.S. trips reacted with fury on Saturday to new American travel curbs they said were insulting and discriminatory, as five Iraqis and a Yemeni were stopped from boarding a New York-bound flight in Cairo. 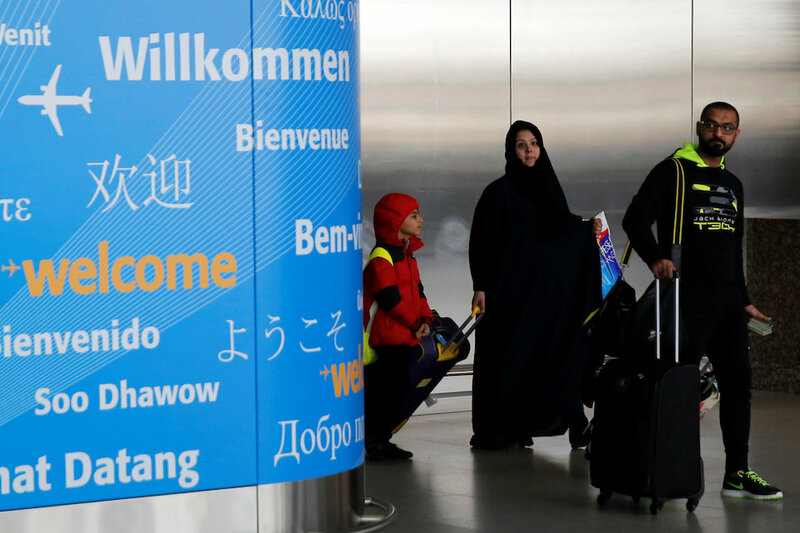 In some of seven Muslim-majority countries affected by the restrictions, would-be travellers preparing family visits, work trips or seeking to escape war reported chaotic disruption to their plans. Some said they had been humiliated. Iran, one of the seven countries, said it would stop U.S. citizens entering the country in retaliation to Washington’s visa ban, calling it an “open affront against the Muslim world and the Iranian nation”. “It’s not right to portray huge groups of Arabs and Muslims as possible terrorists,” Najeeb Haidari, a Yemeni-American security manager in Yemen, said a day after Trump put a four-month hold on refugee arrivals and temporarily barred travellers from war-torn Syria and six other mainly Muslim nations. 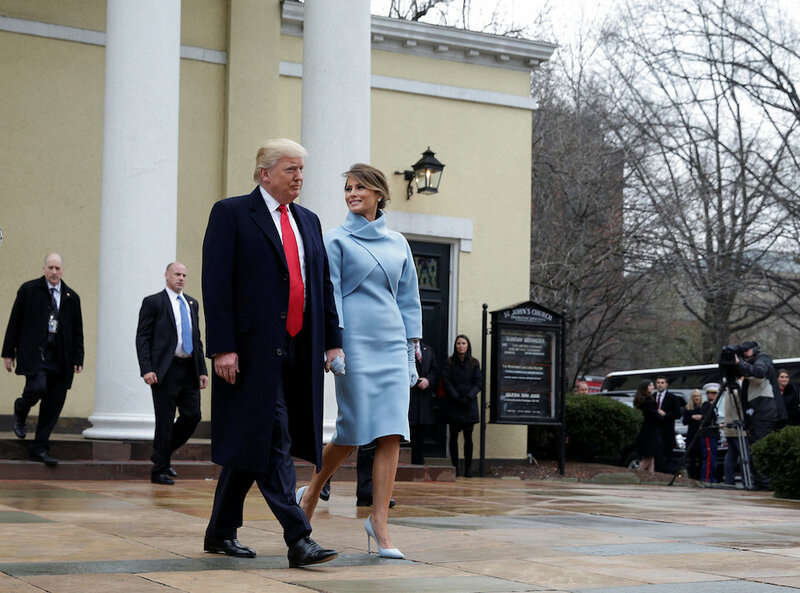 “This is a stupid, terrible decision which will hurt the American people more than us or anybody else, because it shows that this president can’t manage people, politics or global relationships,” Haidari added. Sudan called the decision to ban entry of its citizens very unfortunate in light of “historic steps” just weeks earlier to lift U.S. sanctions for cooperation on combating terrorism. In the most sweeping use of his presidential powers since taking office a week ago, Trump signed an executive order on Friday to pause the entry of travellers from Iran, Iraq, Libya, Somalia, Sudan, Syria and Yemen for at least 90 days. He said separately he wanted the United States to give priority to Syrian Christians fleeing the war there. The travel curbs began immediately, causing confusion for would-be travellers with passports from the seven countries. A Syrian family holding U.S. visas who had travelled overnight from Beirut to Paris was prevented from boarding a connecting flight onto Atlanta, Lebanese airport sources said. They flew back to Beirut later on Saturday. In Doha, Qatar Airways advised passengers bound for the United States from the seven newly banned countries that they needed to have either a U.S. green card or a diplomatic visa. A 34-year-old Sudanese man who won the U.S. Green Card lottery said he was worried he would be forbidden entry. “If I’m barred…this will destroy my life because I resigned from my work in Sudan and was preparing to settle in America,” he said. Fariba, an Iranian-American who declined to give her family name and lives in New Jersey, said her parents would not be able to make a planned visit to celebrate Iranian New Year in March. Some people planning U.S. travel said the curbs would harm their careers. Others feared for the safety of their families. In Baghdad, Bayan Adil, a doctor working in the Iraqi Health Ministry who applied for a U.S. visa to attend a medical seminar, said Iraqi academics should visit Europe instead of the United States, where they were no longer welcome. “Trump’s decision is unfortunately a humiliating insult not only for us as academics but for all Iraqis,” she said. Her comments were echoed by Abd Al-Jafar, a 43-year-old university professor in Sudan’s capital Khartoum, who said he had sought to go to the United States for doctoral studies. In Beirut, Joumana Ghazi Chehade, 34, a refugee from Yarmouk in Syria living in the Lebanese capital’s Burj al-Barajneh camp, said the decision would “destroy a lot of people”. OTTAWA/TORONTO (Reuters) – Prime Minister Justin Trudeau welcomed those fleeing war and persecution on Saturday even as Canadian airlines said they would turn back U.S.-bound passengers to comply with an immigration ban on people from seven Muslim-majority countries. A second tweet included an archive photo of Trudeau welcoming a Syrian refugee at a Canadian airport in 2015. Confusion abounded at airports around the world on Saturday as immigration and customs officials struggled to interpret the new U.S. rules. In Canada, WestJet Airlines said it turned back a passenger bound for the United States on Saturday to comply with an executive order signed by Trump on Friday. WestJet spokeswoman Lauren Stewart said the airline would give full refunds to anyone affected by the order. It did not say which country the passenger had come from. The order would help protect Americans from terrorist attacks, the president said. Stewart said WestJet had been informed by U.S. Customs and Border Patrol (CBP) that the ban did not apply to dual citizens who had passports from countries other than those covered by the ban: Iran, Iraq, Libya, Somalia, Sudan, Syria and Yemen. “U.S. CBP has confirmed it is the citizenship document they present to enter the country, not the country of where they were born,” Stewart wrote in an email. Air Canada, the country’s other major airline, said it was complying with the order but did not comment on whether it had yet denied travel to any passengers. Ahead of President Donald Trump’s inaugural address, it seemed no one knew exactly what to expect. Today was clearly an occasion for the use of the teleprompters that Trump used to mock his predecessor for employing. But, with the prepared text scrolling before him, would Trump offer the sobriety of his speech after meeting the Mexican president last August, or that of Election Night — or the bellicosity of his Convention acceptance speech? Sobriety won the day. But the speech was much more than sober. It largely lacked lofty language, but contained a full-throated populist vision, delivered with confidence, and signaled this from the start in one of its most memorable lines: “Today we are not merely transferring power from one administration to another or from one party to another, but we are transferring power from Washington, D.C., and giving it back to you, the people.” This might be heard to echo Ronald Reagan’s 1981 statement that “government is not the solution to our problem; government is the problem,” but that would actually miss Trump’s point: The speech did not oppose government — it opposed the governors. Trump once again, as at his Convention, made a presumably conscious play for Franklin Roosevelt’s “forgotten man” of 1932. “The forgotten men and women of our country will be forgotten no longer. Everyone is listening to you now,” Trump declared. But while some on the right have tried to recast this phrase and return it to the meaning of William Graham Sumner, who used it first in 1918 to refer to taxpayers forced to pay for reforms, Trump made no such allusions. Government must be part of the solution to his promises, if only because those promises are being made by the new head of the government. And therein lies the great risk of the speech. The new president pledged today to rid the country of the problems of drugs, crime, inner city poverty and closed factories, and to launch an ambitious program of infrastructure spending. He pledged to “eradicate completely from the face of the earth” what he predictably called “radical Islamic terrorism.” None of these promises are likely to be literally fulfilled. Trump’s pledge to “never, ever let you down” seems a dangerous echo of Jimmy Carter, who said the same thing, and received 40 percent of the vote when he ran for re-election. The question then will be whether enough has been done to avoid popular disappointment. Other questions ahead of today’s speech went more to style than to substance. Would Trump be gracious and thank his predecessor, as each new president since Carter in 1977 has done? He did. Would he be afflicted by the nervous sniffling of his debate performances (and the Mexican speech), or display the self-confidence that made those exceptions stand out? He sniffled a bit, but not nearly as much as in the debates — he seemed much more confident today than he did then. One of the few things Trump and his aides said about the speech in advance was that it would be short. In the event, it was. The President clocked in at 1,454 words. That compares with 1,366 words in JFK’s inaugural address — the most memorable of the modern era. 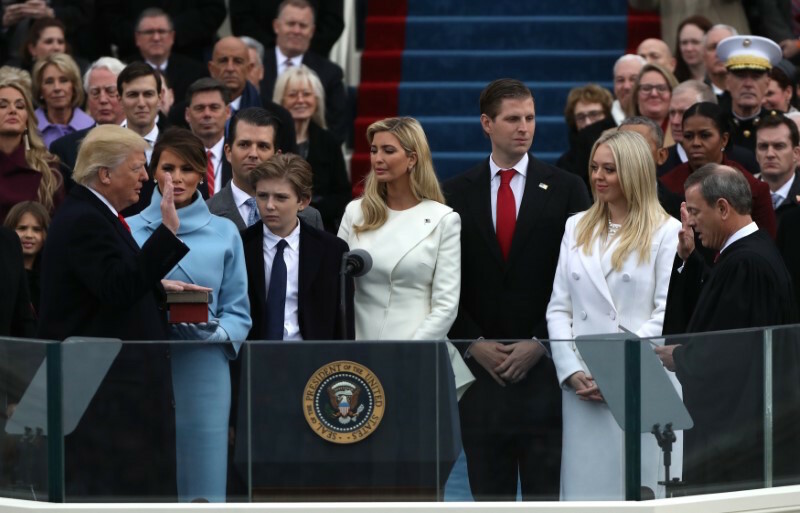 It is far longer than FDR’s fourth inaugural, which, at 573 words, was the shortest modern address — and nowhere near Washington’s second inaugural, in 1793, which set an enduring record for brevity at 136 words. 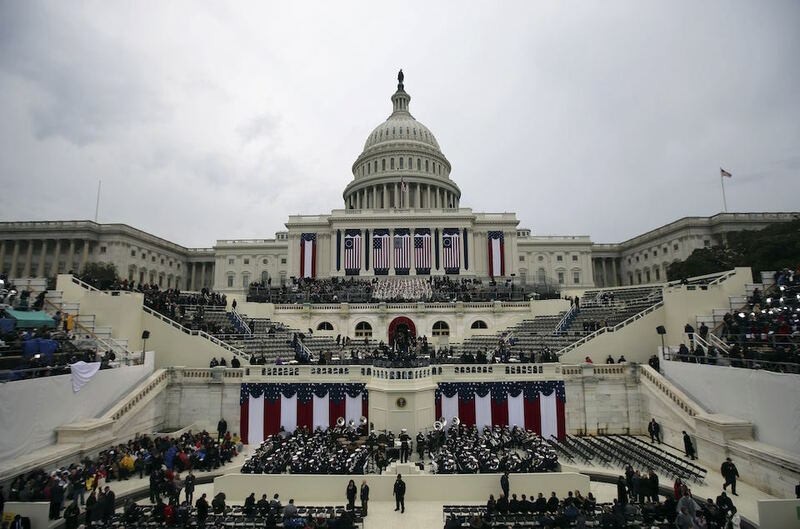 But it was considerably shorter than Barack Obama’s largely unmemorable first inaugural address (everyone, it seems, remembers the day, but, unusually for Obama, very little of what was said); that speech ran 2,409 words.